This event took place on September 30th, 2010. Thanks for attending! View the updated mosaic of conference registrants. Click for a larger, interactive version. Try to find yourself! All freelance language professionals are cordially invited to attend the 2010 ProZ.com virtual conference for freelance translators on September 30, 2010 (International Translation Day). Registration is now open, and attendance is free. Click here to register for the freelancer conference now. For more information, please review the freelancer conference pages. I look forward to seeing you at the event! It's my first time attending to this kind of event, so I apology if this is a stupid question. It's clear that's going to be on September 30th, 2010 but what about the time the conference begins? I would like knowing the same thing.... the hour of the conference for freelancers. Does this mean the Conference takes 12 hours? Is there any schedule yet? Are there any breaks? Great question! The conference will include sessions and panel discussions scheduled at specific times throughout the full 12 hour period with many items available on demand. The other aspects of the virtual environment: chat, networking, exhibit booths will be available all day. A schedule will be made available in the coming weeks so attendees will be able to plan their day accordingly. This panel will be moderated by Renato Beninatto and include representatives from the LSP/translation agency community along with an end client representative and Henry Dotterer, founder of ProZ.com. Thanks for this great opportunity. I am sure it will be a wonderful and informative day. But being Sept. 30th, the World Translators' Day, can we expect for the maximum response and participation? Last year we were busy on organizing and conducting a powwow on that day. Thanks for your comment. Last year we had over 6,900 attendees enter the environment at some point during the day. While it is great that you are organizing and conducting a pow-wow. 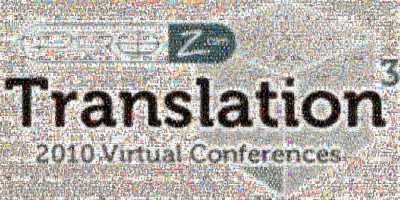 The virtual conference allows translation professionals to gather and celebrate their profession online no matter where they are around the globe. The conference will be live from 10:00 GMT - 22:00 GMT giving even those who have plans plenty of time to pop in for a little while. In addition, those that attend the conference on Sept 30th will have access to session content for 90 days. I hope you will have a few minutes on the Sept 30th to stop by and see the conference in action. I believe that the idea of this conference is a great idea and it is going to be a great event. Thanks for organizing this very conference. This is an awesome project! Looking forward to this. What is the time conversion in the Philippines? Will you provide us a detailed program and guidelines? Will we receive an email reminder of the virtual conference? If we miss out on specific sessions, will we be able to access the recorded sessions? Thanks! Thanks for your interest in the virtual conference! ProZ.com is in the process of finalizing the program and schedule for the event. The detailed information will be made available soon. Registered attendees will receive several email reminders including an attendee guide that will explain all about the virtual conference environment. If we miss out on specific sessions, will we be able to access the recorded sessions? All sessions will be available via recording for free to everyone who logs-in to the conference at some point on Sept 30th. This content will be available for 3 months in the virtual conference environment. See you on Sept 30th.